Now that you have found the perfect dress, come to the beautiful Willow Bridal studio in the greater Boston area to find the perfect veil, hair adornment, or sash. Willow Bridal designs have been created by Nina to coordinate with all bridal looks, Whether you see your style as modern, vintage, bohemian, retro-glam, or classic, here you will find an incredible selection of hair adornments and veils (far greater than available in bridal salons). By coming to the Willow Bridal studio you can save hours of searching on-line and actually try on all those possibilities you've been admiring in pictures but just can't be sure they work for you. Bring your dress and have a fun time working with Nina on a custom design that is perfect for you and perfect with your dress. Superior materials, expert construction, elegant design—always—and for a surprisingly reasonable price. 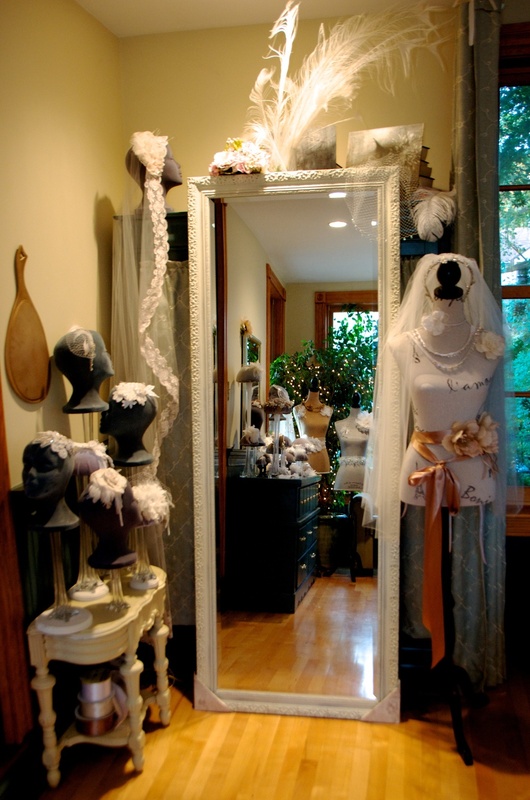 The Willow Bridal Studio contains hundreds of pieces and dozens of veils: truly unparalleled selection. Here you can try on pieces in person, have a veil made to measure, or consult with me about a custom design. The studio also has a dressing area, so if you would like to see the 'total look' you are welcome to bring your dress with you to your appointment.